I found this bunny roll idea in several places online, and I couldn’t resist making a batch of my own. They are simple and quite adorable. Place a piece of parchment paper on a half sheet pan, and spray the parchment with cooking spray. Make sure you have enough room in your refrigerator for the sheet pan where the rolls will rest overnight. In the bowl of a stand mixer with a dough hook attachment, add the water. Sprinkle the yeast over the water. Let stand until the yeast and water mixture looks creamy, about 5 minutes. Next, add the ingredients from the sugar through the whole-wheat flour to the bowl. Let the mixer knead the dough for about 10 minutes. The dough will be elastic and sticky. Remove the dough from the bowl onto a clean work surface that is lightly dusted with all-purpose flour. Divide the dough into 6 equal pieces. Sprinkle a little extra all-purpose flour over the dough and on your hands if the dough sticks. 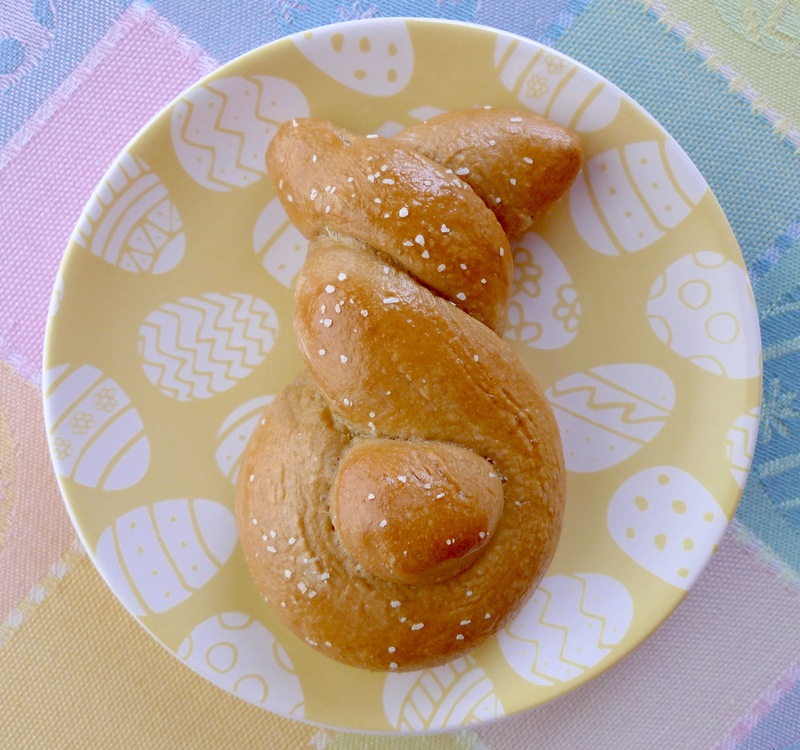 To make bunnies, roll 5 of the pieces of dough into long ropes, each about 12 inches long. Take the two ends of each rope and twist them over each other twice, leaving about an inch of both ends sticking out on top for the ears. Make sure the bottom has a loop with a hole in the middle to make room for the tail. Cut the remaining piece of dough into small pieces for the tails. Roll each piece into a ball, and place the ball in the center of the loop. 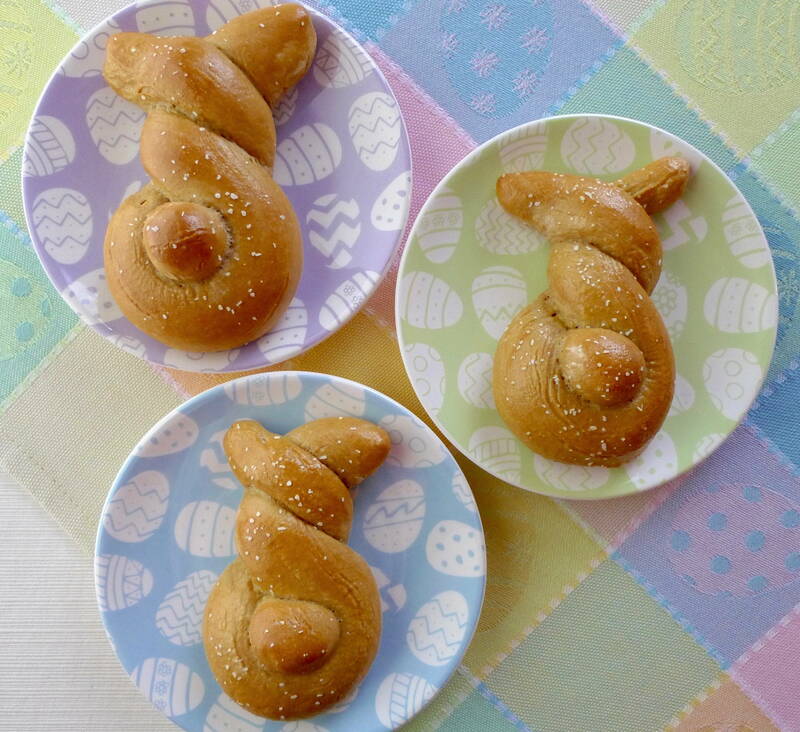 (If you have leftover dough, you can form a little Easter egg shape to go with the bunnies!) Place all of the rolls on the prepared baking sheet. Take care to leave enough space between the rolls to allow them to rise without touching each other. Spray the tops of the rolls with nonstick cooking spray and cover with plastic wrap. Let the rolls rest in the refrigerator overnight. The next day, remove the rolls from the refrigerator. Let the dough rise in a warm place for about 90 minutes, or until close to doubled in size. Preheat your oven to 350 F. Brush the rolls with the beaten egg, and sprinkle a little coarse salt on top. Bake for about 20 minutes, or until the rolls are golden brown and cooked through.